You might have heard us mention the 6100 Flexible Curtain Track in previous blog posts or on our Facebook page. We talk about this fabulous track so often because we love how diverse it is. Whether you are working on a small project in your home, boat or RV, or even on a larger project, chances are, this track will be the best product for the job. Our 6100 Flexible Curtain Track is one of our most popular tracks and for good reason. The flexible track is a white, I-beam configuration track that can be mounted to the wall or the ceiling. It’s a durable track with an internal metal spine, and is available in standard, medium, and heavy duty sizes to accommodate various weights of curtains or draperies. It’s not called the Flexible Curtain Track for nothing! What makes it so great is that it can be bent by hand without compromising strength (no need to be Superman! ), so it can be used for straight and curved applications. Perfect for unique angles, like bay windows, around claw foot bathtubs, and even storage areas, this track is your go-to for your next project. The 6100 Flexible curtain track is sold by the foot and requires mounting cartridges every 10 inches. Our new and improved website provides an entire list of compatible products so you can easily find everything you need to complete your next project. If you are ready to tackle your next project, don’t be intimidated. Our friendly customer service team can help every step of the way. So whether you are a do-it-yourselfer or a professional interior designer, we’ve got you covered. Once you have completed your project, we would love to see your pictures. Who knows, we may even include them in a future blog post! Summer is quickly approaching, which means many campers are pulling their RV’s out of storage and planning their road trips. This begins the spring cleaning and updating process, one that Curtain-Tracks is happy to help navigate. 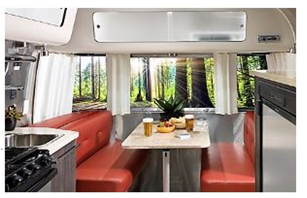 Because RV’s are investments that are meant to last a long time, things like curtains can begin to look dated long before the mobile home is ready to retire. Curtain-Tracks can help you update your home on wheels in a variety of ways. We can supply custom tracks or curtains that will give your RV a facelift with a whole new look. 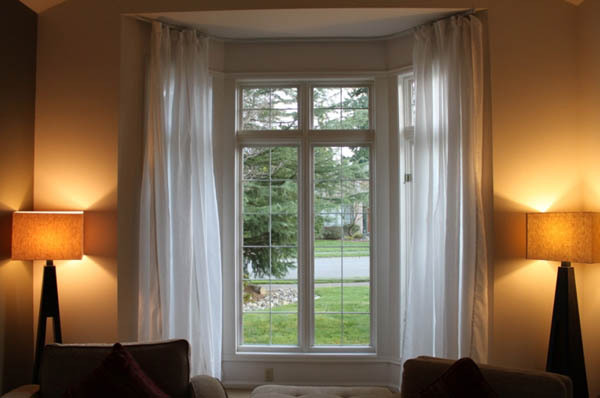 We can help you select curtains for the small windows, a divider between the living and driving quarters, a divider between beds, or even a shower curtain. When you step back and look at how many curtains and tracks are used in a camper, you’ll be checking out our RV Curtain and Hardware Collection in no time. What is the purpose of camping? We believe it is to relax, unwind, and connect with family. While many of these goals can be accomplished around the bonfire or on the hiking trail, there will be some days that are just too hot or too rainy to enjoy those activities. On those days, campers are thankful for the roof over their head in the RV. Those who have worked with our specialists are even more thankful for our products. Our eclipse curtains are great for homes on wheels because they keep out 98% of the light and help block sounds. For parents, this can be the difference between nap time and a ridiculously grouchy little one. (Even for adults, this mid day nap might be the key to a restful and relaxing weekend!) The darkness created by our curtains can also mean that it’s easier to get the baby to sleep for the night even though the sun stays up late. In addition to less light and sound, these curtains can also help to keep the RV cool during a hot summer day. Because the sizes of windows or sleeping quarters in a mobile home can vary by model and year, curtain sizes are often custom. Have we mentioned yet that we LOVE helping our customers with custom orders? Well, we do! And, we have lots of satisfied campers who will tell you that our tracks and custom made RV curtains fit just perfectly in their RV. If you would like assistance with your spring RV project, consider filling out our request form. You can include as much or as little information as you have, and you can even upload a picture of the area you are working on. One of our specialists will give you a call to get your home on wheels ready for it’s busy season. Safe Travels! Did you know that only 84% of Americans use their garage to park a car? Things like storage and workspace are beginning to invade garage space, according to a recent poll. Because of the flexibility needed in a garage, we would like to suggest a curtain wall created by some of Curtain-Tracks products. Creating a curtain wall as a visual barrier can immediately create a feeling of calm and order in the garage. This visual boundary can also add a bit of flair and design to the garage, as a warm welcome home after a long day at work. Much better than a welcome home to chaos and reminders of projects that are not yet complete. The second curtain wall that could be used in a garage is one that can be opened and closed depending on what project is happening at the time. If your spouse is cutting tile, for example, a curtain track surrounding the wet saw would help to catch any spraying water and would also dampen the sound. We would recommend one of our heavier duty tracks for this purpose, such as our Extra Heavy Duty Track. This track has an industrial look that will fit an industrial space, and is made of aluminum which will hold up to the elements of a garage while also keeping it’s strength. You could also use a Flexible Track to create a curtain wall with an unusual shape, or any of the additional tracks listed here. Because of the nature of a garage, we suggest using one of our more rugged, industrial curtains. We have a few that are not listed on our website, so give us a call at 1-888-434-7444 to learn more about these products. Another option for the more budget conscious DIYer is using a tarp from your local hardware store. Hanging a tarp or heavy duty curtain in a space like this can contain the dust and even some of the sound that comes along with projects happening in the garage. So, what project have you been putting off? Why not create a fun and functional space in your garage today and start checking off your to-do list? Many of our regular Curtain-Tracks blog readers know by now that several of our curtain tracks come in custom lengths that can be bent to the appropriate shape; but, what happens when you need more than the amount of length that is offered on our website? Curtain-Tracks has you covered with a few options. Not only are our customer service representatives at Curtain-Tracks top notch, our product developers are genius, too! They know that many applications for our products are custom and that many are used in very large spaces. They also know that quality is a high priority for our company, and a track that makes curtains stick is just unacceptable. A splicer will allow our tracks to be mounted end to end without getting in the way of a smooth glide from our curtains and our gliders. Just one of these splicers will double the length of curtain coverage in a jiffy. Need even more length? Just add more splicers! Tracks such as the 88001 Privacy Cubicle Track or the 4108 Bendable Beam Track are two that have splicers that match for under $5 each, making an easy and inexpensive choice for large projects. Our splicers come in a choice of colors to match your track and are very easily installed. Other tracks, such as the 3120 Extra Heavy Duty Track, do not come with an option of a splicer. This track comes in 12 foot sections that must be cut to 8 foot and 4 foot or two 6 foot sections unless shipped via freight. No fear, however, because these tracks can also be mounted end to end in order to stretch a longer distance. They just need to be aligned edge to edge, and our carriers can glide right through. It is wise to become good friends with your level while hanging tracks in a large space. The edges of the tracks should be aligned as closely as possible so there is no gap in between, and the sides should be as flush as possible. Although our splicers and our carriers allow for carriers to glide through with ease, it is our recommendation to do a little planning to determine where the seam will fall. It is best for the seam to not see a whole lot of action, so we recommend putting it in the middle of the track, where the curtains meet. New Colors, New Fabric, and A New Track...Oh My! In our last blog post, we shared information on our new Chateau Privacy Curtains. Today, we want to tell you about a couple other new products, the nylon Dobie curtain and new colors of our 84004 track. The nylon Dobie curtain is our newest waterproof shower curtain. It has all of the same wonderful qualities of our shower curtain line with one added bonus: it’s pretty! 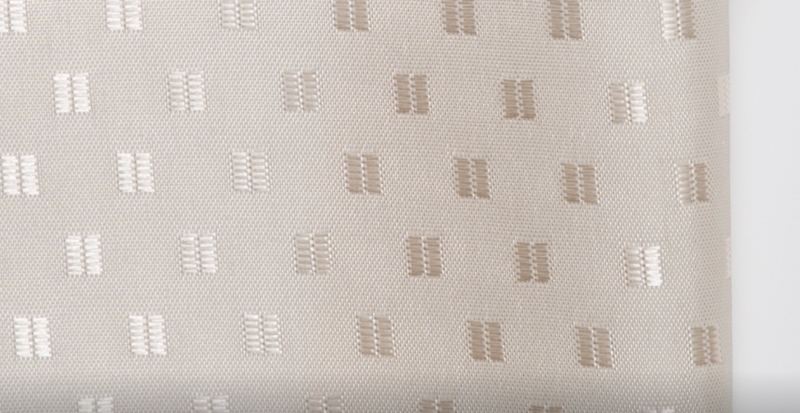 There is a subtle pattern repeated in the weave of the fabric that gives this polyester an elegant look and feel. The depth of this pattern creates visual interest and because it is available in white and beige, the nylon Dobie curtain will look great in any bathroom. Behind the pretty face of this new curtain are the features that make it a logical choice for any wet space. The fabric is polyester treated to be water repellent for 50 commercial washes (the industry standard is 12 washes), making it not only pretty but also durable. One of our most popular tracks, the 84004 Ball Bearing Carrier Curtain Track, has two new colors for a total of four options. Now available in white, silver, black and bronze, the color of this track is sure to work with your next project. 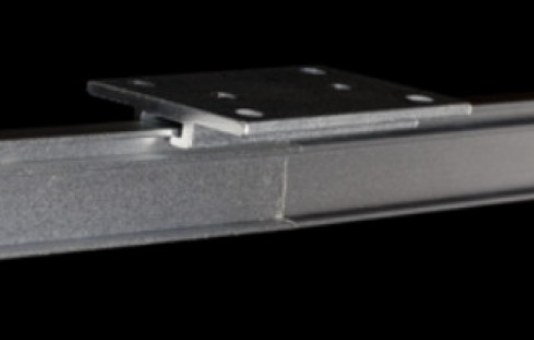 The 84004 strong aluminum architectural track accommodates smooth rolling ball bearing carriers and can be mounted end to end for wider spans. Mounting holes are punched on 16 inch centers. This track is available in 8 foot sections, but please give us a call if you need longer lengths. Stay tuned for our new line of industrial tracks coming soon. We are excited to share that these tracks, just like the Curtain-Track standard, will be strong, durable, and good looking. They will be able to take the toughest of the tough abuse and hold the heaviest of the heavy curtains. We are so excited about all of these new, awesome products! Some of these products are on our website, ready for you to order. Some will be posted shortly. All of them will make you happy! Visit www.Curtain-Tracks.com today to check out all of the updates. Spring has sprung, which has many of us thinking about spring cleaning. Our first project at Curtain-Tracks was to update our website. If you haven’t already checked it out, you really should. It’s pretty spiffy! We hope you’ll be impressed by the clean lines and simple layout. The next project on our spring to do list was to bring in new products. The first to highlight is going to be a customer favorite because of it’s versatility and durability. It’s time to introduce...drumroll please… Chateau Privacy Curtains. This fabric is part of our privacy curtain line, which means they can be used in homes, offices, hospitals, medical facilities, and just about anywhere you need a little seclusion. Our Chateau Privacy Curtains are soft and have a linen appearance, making them the perfect choice for your spring spruce up project. The look of linen has a natural depth and beauty that breathes a little bit of fresh air into the space. However, linen is difficult to care for. Real Simple’s Fabric 101 Guide recommends hand washing in cold water, letting it air dry, and ironing it. Ain’t nobody got time for that! We believe your décor, whether in a clinic, hospital or office space, should look good but also be easily maintained. Enter Chateau Privacy Curtains - giving homeowners the look of linen, with way less work because it is made of 100% polyester and is machine washable. Not only is the fabric easy to maintain, but they are nearly indestructible. From the seams to the grommets, this product is a customer favorite because of their durability. The header of these curtains is reinforced with three layers of fabric and another layer of mesh. Talk about strong! The seams and hems are secured using Safe-T-Stiches so you don’t have to worry about ugly stray strings hanging out or a hem falling to the ground. The Chateau Privacy Curtain is hung with strong grommets made of rust proof nickel plated brass rings. The cherry on the top is that these curtains are flame retardant and meet NFPA 701 and CA Fire Marshal Title 19 requirements. Available in 19 different colors, they are pretty enough to work in the home or business, but they are durable enough to stand up to the use of a medical facility as well. Plus, they are affordable allowing you to stay on budget. If you are installing these curtains in a business or medical facility, be sure to check with your local fire code you needs these curtains with or without mesh to ensure compliance. Next, give us a call to request a sample color because the images online may differ slightly from the actual color. We are happy to send out a sample, though. Just give us a call at 1-888-434-7444. Nearly every year, it seems Puxatawney Phil predicts winter will last a little longer, but the calendar officially tells us that spring is here. And if your house is anything like ours, that means the honey-do list has grown to include lots of outdoor projects. At Curtain-Tracks, we like to suggest you move one of those projects to the top of the list: Adding Curtains to Your Pergola. This outdoor project makes for a great first spring project for a few reasons. Adding curtains to your pergola is easier than it sounds plus it gives a lot of bang for your buck. Simply adding a curtain track and some durable curtains, and your outdoor living space transforms from drab to classy. You can a lot of fabric to create a lush, layered effect. For a light, airy, and beachy feel, try using a sheer fabric that can easily blow in the breeze. For a more rustic look, try a textured fabric like burlap that will add great depth to the space. A simple and rustic tie back such as twine or even a small cut of the same fabric will allow the curtains to be out of the way when you don’t need them but still add another layer of design. We suggest bumping this project to the top of your honey-do list so you can create a cozy retreat to enjoy after a long day of yard work (and all of the other to-do items on your list). Imagine mowing and weeding the yard in between soccer games this weekend and then being able to sit back with an adult beverage to admire your hard work. 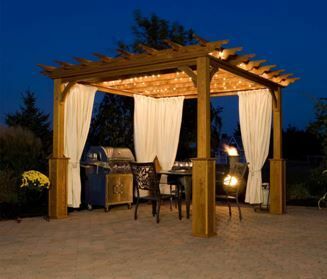 Would it be more relaxing underneath your bare pergola that needs a coat of stain or would it be more relaxing behind fresh curtains blowing in the wind? We know which we’d prefer as we toast our family for a job well done. Not only are Curtain-Tracks products exceptional for changing the aesthetics of your patio, but they are functional as well. Using our plastic tracks for outdoor use is a great choice because they won’t rust in the elements. You could also try our steel hooks for the same reason; they won’t rust and the look is simply classic. So, the next time you are looking at your to-do list, consider drawing an arrow to the top of the list from the “update pergola” item. You won’t be sorry. And, bonus! We will help you place the order so you don’t forget any measurements or hardware. Heck, you can even call us right from your patio: 1-888-434-7444. Curtain-Tracks spends lots of time helping to make our customer's homes, offices, RV's and boats feel fresh and updated, so we thought it was time to make our "home" feel that way, too. With that being said, Curtain-Tracks.com has gotten a face lift! And boy, are we excited about our beautiful and easy to navigate website. The new design is simple to use with clear-cut language and titles that make finding your favorite products a breeze! Whether you are looking for curtain tracks, hardware and accessories or curtains, the large buttons front and center on the main page, make it easy to get started on your browsing. One of the first things you will notice when you visit our beautiful new site is the bold green box in the upper right corner. That’s by design. We want you to be able to easily search for your favorite product quickly and easily. Put in a keyword, and you’ll be amazed at the simple but thorough results. The product you searched for will be there, front and center, PLUS, all of the products that are related to that item are included as well. Even though we offer several different products, the website and navigation are not overwhelming. 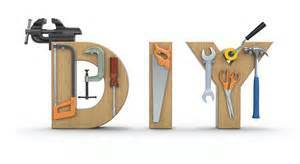 The pictures and descriptions are simple allowing for a quick and easy selection of the product or products you are searching for, however, the additional products that are included will hopefully prevent the “oh bummer I forgot that” moment by suggesting other items you might need for your project. Another feature within on our site is a second tab for even more information! We love that there is so much information so easily accessible for those who want to learn more, but that the information is not in your face and confusing. Another favorite new feature is the categories of our applications. These have always been part of our site, but you might not have noticed them because they seemed to be hidden. Not anymore! Now, the beautiful pictures pop out at you hopefully causing some inspiration for your next project. After you have had some time to surf through our newly designed website, you might feel the urge to start a new project. If that's the case, you can use our request quote link and we will be there to help you figure out the cost. We value our customers and want to make the browsing and shopping experience painless, that's why we redesigned our website- with you, our customers, in mind! It's Your Lucky Day! New Colors For 2 Great Tracks! Anyone out there a Lottery player? Have you ever wondered about the probability of winning the Powerball? The best odds are 1 in 38, which will get you a whopping $4.00. The grand prize odds are a little more of a stretch, at 1 in 292,201,338. Although we all have that tiny voice in the back of our heads that believes that “someone has to win so it may as well be me,” realistically, we are paying for the entertainment and excitement of playing the game. At Curtain-Tracks, we like to give you 1-in-1 odds of getting a great product. We pride ourselves on exceptional customer service and high quality products that last and now are offering additional color options for two of our most popular tracks, 84003 and 84004. These curtain tracks now come in two additional colors. Instead of just white and silver, these awesome tracks are available in black and bronze. So it’s your lucky day if you ever looked at either of these products but didn’t consider them because they didn’t match your color scheme. We believe these four colors will be able to to match just about every color palate in any office or home. 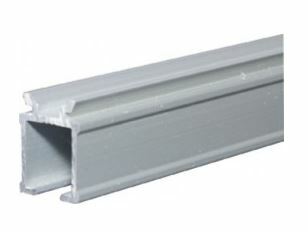 Both of these tracks are made of strong aluminum that accommodates smooth rolling ball bearing carriers. The track, which can be mounted on the ceiling or the wall, can be bent in our facility but not by hand, and comes in 8 foot sections. This fantastic track works with a wide range of compatible accessories, including carriers, master carriers, end stops, and batons. If you already have these fantastic track and are in need of compatible parts, we have a wide variety including metal end stops, ceiling clips and wall brackets. Curtain-Tracks’ winning numbers are 1-888-434-7444. Give us a call today so we can make your day lucky! HGTV has always been one of our favorite go-to's when it comes to the latest style and trends. When we saw their post with this photo of floor to ceiling curtains and curved walls, we just had to share. There are so many great things about every single thing in this picture, we just can’t hide our excitement! Let’s break down everything we love about these curtains. Somehow, the curtains in this room design are both a focal point and a back drop. This is the beauty of floor to ceiling curtains. They can blend into the wall if you use similarly colored paint and fabric; they can serve as an attention grabber if you choose opposite colors; and, obviously, they can actually cover windows. For this type of project with the unique curved walls, we love our best selling flexible curtain track. The beauty of our flexible track is that it can be custom bent (by hand!) to follow even the most unusual curve. 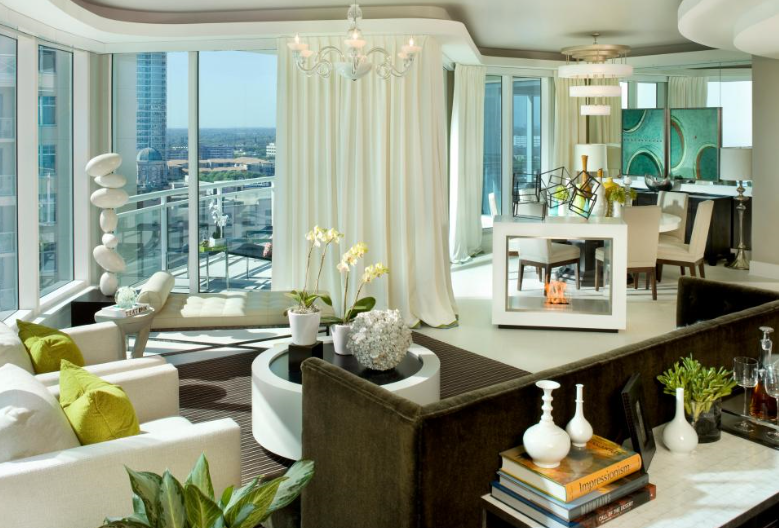 This attention to detail helps to create the custom look that prevails through the entire room. Something as simple as this detail can be the finishing touch that pulls everything together. One of the outstanding features of this room is the amount of texture from the curtains. In addition to being pristine white (beautiful! ), there is a lot of fabric which creates a great deal of texture. With a large amount of fabric, even when the curtains are drawn closed, there is plenty of texture to go around. Our 6100 track is the perfect fit here because it comes in a heavy duty gauge to handle the weight of the curtains. When choosing your track, you should consider the style as well as the total weight of the curtains. Weight comes not only from the type of fabric, but from the quantity of fabric as well. Many people forget to factor in the height of the curtains, which can add a fair amount of weight that will need to be hung on the track. Our selection of heavy duty tracks can stand up to the challenge. The 6100 track has so many great qualities, it’s no wonder it is one of our best sellers! It can be used in so many different applications and it can create such a custom look. Visit Curtain-Tracks.com to order yours today. Don’t forget to check out the compatible products at the bottom of the page to finish your project. You’ll need mounting cartridges for every ten inches of length. Contact us today to turn your room into an HGTV photo!